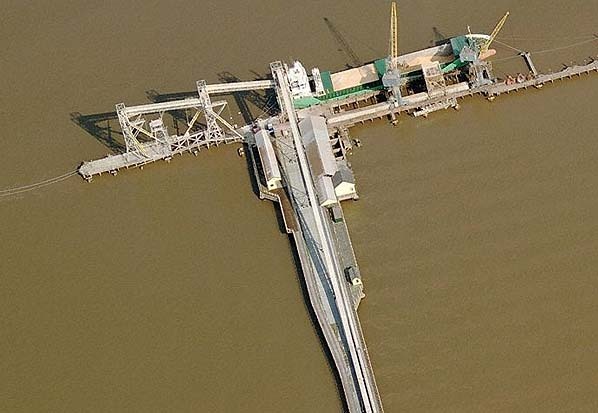 Present state: The pier has been converted into a grain and animal feed terminal and is still rail connected alothough the line now ends short of the station.. The station buildings have been refurbished as part of the terminal. The signal box is intact complete with lever frame. 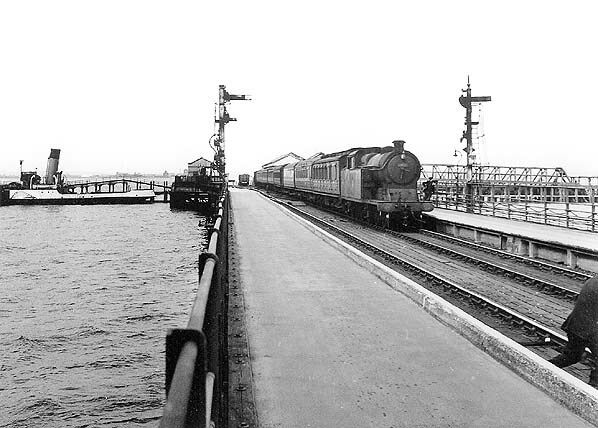 Notes: New Holland Pier Station was built of timber and was sited at the pierhead witrh access via a ramp to a floating pontoon from where ferries departed for Hull. 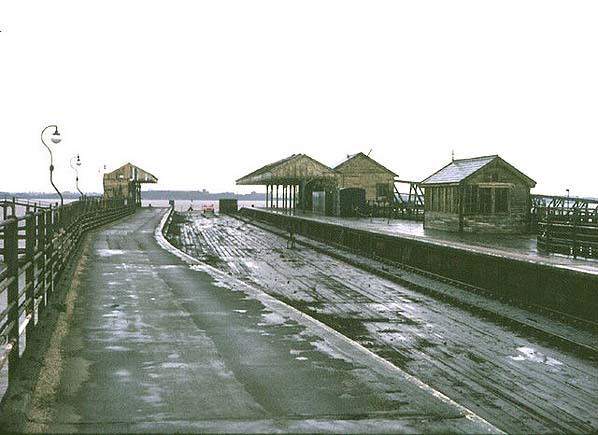 The station had two platforms with timber buildings on each, initially there were two tracks, a carriageway and a footpath. 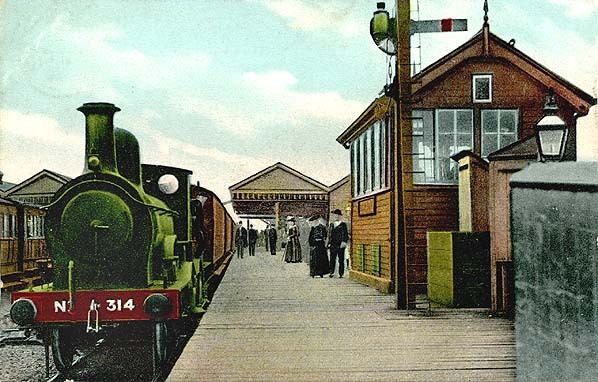 The station was provided with a signalbox on the 'down' platform (later this became the 'up' platform). The pier was rebuilt between 1922 - 1928 when three tracks were provided. 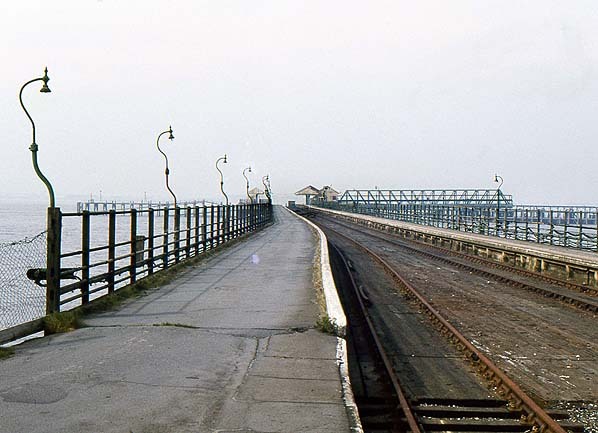 In later years the middle track was lifed alon g the full length of the pier and the 'down' track was lifted at the pier head and the station was allowed to deteriorate prior to clisure in 1981 by which time it was in a very dilapidated condition and operated a s a 'long temporary siding' from Oxmarsh Crossing. Ferry tickets issued by the LNER were still being issued up to closure in 1981. 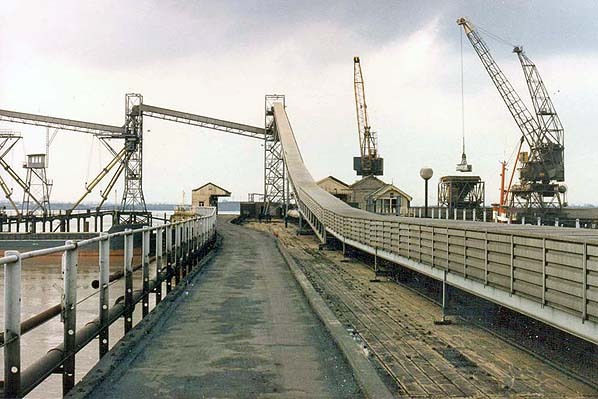 In 1998 pier was opened as a grain and animal feed terminal retaing a rail connections, the station buildings have been refurbished and incorporated into the new terminal. a front for smuggling goods, especially gin and it was Holland’s Gin that provided the inspiration for a name for the settlement. The name really caught on when the New Holland Proprietors set about operating an improved ferry service. The operation at New Holland expanded rapidly; in 1826 the Yarborough Arms pub was built. A stage coach service began in 1828 but it was with improving the road and buying the Magna Charta ferry in 1832 that mail stage coaches began to use the New Holland ferry. Holland scheme and in 1832 the Magna Charta started three round trips a day with an additional crossing on market days. A horse boat was added for animal transportation. When in 1836 the London Mail coach transferred from Barton to New Holland, New Holland became the preferred crossing point. There had already been principal services to Boston, Lincoln and Nottingham although with good turnpikes available, freight traffic stayed on the waterways until the coming of the railway. The Great Grimsby and Sheffield Junction railway were the first to propose a line to New Holland but before their plans came to fruition they had amalgamated with the Manchester, Sheffield and Lincolnshire Railway (later to become the Great Central). to enquiries into the railway financing, and the MS&L was known as the 'Money, Sunk and Lost'. Between New Holland, Lincoln and Grimsby the fabric of the lines was built for £36,000 and the line to New Holland was opened on 1st March 1848. The M&SL had a good working relationship with the Great Northern. The New Holland - Grimsby line opened on the same day as the GNR's first line, that from Grimsby to Louth. The MS&L allowed the GNR to run trains over its line in return for reciprocal running powers to Louth so the first service ran from New Holland - Louth. From the beginning, the trains went along the 1375 feet long New Holland pier built by John Fowler, it had two tracks, a carriageway and a footpath and a year later passengers disembarked on to the floating pontoon that eased the passage on to the ferries. Goods now transferred from waterways to the railways and passengers and mail came from the stage coaches. In the same year 1848, a Bill was proposed which could have had far-reaching consequences for railways in the area. This provided for a tunnel under the Humber, connecting with the railway lines on both the north and south banks. Although passed by the House of Commons, the Bill was rejected by the Lords. their 'London Extension' to Marylebone. Although there were two stations they were not listed as separate stations in the Railway Clearing House handbook until 1904 and Bradshaw didn't recognise them as separate stations until May 1945, many tickets just refer to New Holland. On 1st March 1849 a branch opened from a junction south of New Holland Town Station to Barton on Humber and in 1910 a branch opened from Goxhill one station south of New Holland to Immingham Dock, both braches were provided with a service from New Holland. The initial service to and from New Holland consisted of five trains daily in each direction, with two each way on Sundays. By 1922 there were 14 daily trains between New Holland & Cleethorpes with 7 on Sundays, 12 daily trains between New Holland and Barton on Humber and 6 daily trains between New Holland and Immingham Dock. a rebuilt Yarborough Arms was opened. The schoolroom was licensed by the Bishop of Lincoln for services and the church was opened in 1901. If New Holland began with smuggling and the railway was born in corruption, the railway operation was no better when the Manchester, Sheffield and Lincolnshire Railway fell out with the Great Northern Railway which ran services from Louth. Ferries would sometimes leave just before the Great Northern Trains arrived at New Holland Pier station. Also the library in New Holland was financed by fines on railway employees. wagon sheet repair shops, skills used in the repair of sails could be put to a railway use. In 1922 the original wooden pier was replaced by the present pier the three earlier vessels used on the service across the Humber were replaced by the three paddle-steamers Wingfleld Castle, Tattershall Castle, and Lincoln Castle between 1934 and 1940, these were built to take passengers and cars and a car ramp was provided at the end of the pier to drive cars down to the ferries. By closure of the station the service was operated solely by Sealink’s Farringford, a diesel-powered paddle ferry dating from 1947. The Branch to Immingham Docks closed in 17th June 1963, an early casualty under the Beeching cuts. In 1969 there was a proposal to close the service between Cleethorpes, New Holland and Barton on Humber but this was rejected by the Minister of Transport although the line between Grimsby & Louth closed from 5th October 1970. With the building of the Humber Bridge and the closure of the Humber Ferry the closure of the station at New Holland Pier came as no surprise. Work on the Humber Bridge, now the world’s largest single-span suspension bridge, began in 1972 and was scheduled for completion in March 1980. 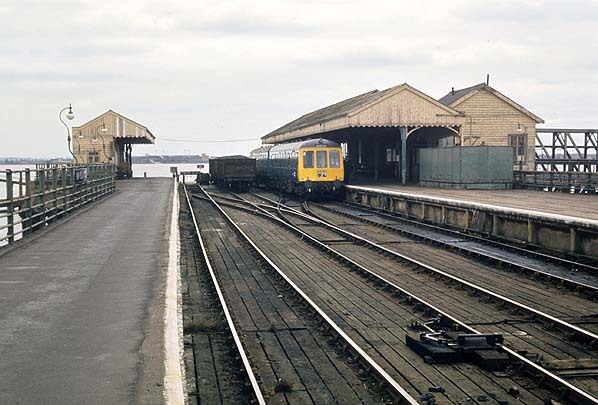 In mid-1979, therefore, British Railways Board gave advance notice of its intention to discontinue the service to New Holland Pier Station from the date of opening of the bridge including the withdrawal of passenger train services between New Holland Pier and Barrow Road Junction, and between New Holland Junction and Barton Junction. same time with a new bus service taking passengers across the bridge from Barton. 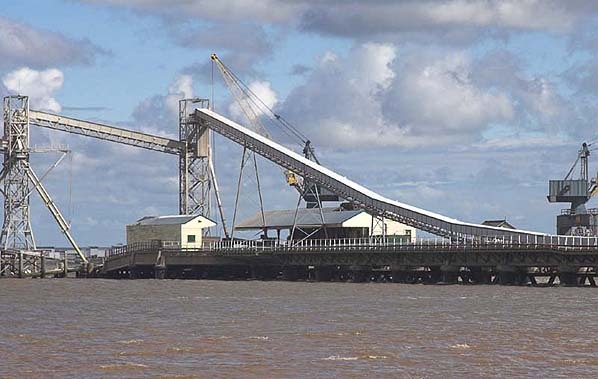 After closure New Holland Pier was taken over by New Holland Bulk Services, who started a grain and animal food import and export business in 1984. New Holland Bulk Services is still rail connected although rarely usedused, the Barrow Road signalbox to the south of the station still stands. timetable showed ten trains daily ineach direction to Grimsby, with four (rising to six in summer) on Sundays. Normal journey time for the l6 miles from Grimsby to New Holland Pier was just under 40 minutes. The ferry service,across the last great waterway in Britain to be bridged, took an additional twenty minutes. Sources: Railway Magazine, October 1981 and New Holland: 1803 until the Present Day from Pluralist web site. See also: Daves Railpics of Lincolnshire web site for more pictures of New Holland Pier and the Lincolnshire & East Yorkshire Transport Review web site. that have just disembarked from the ferry. 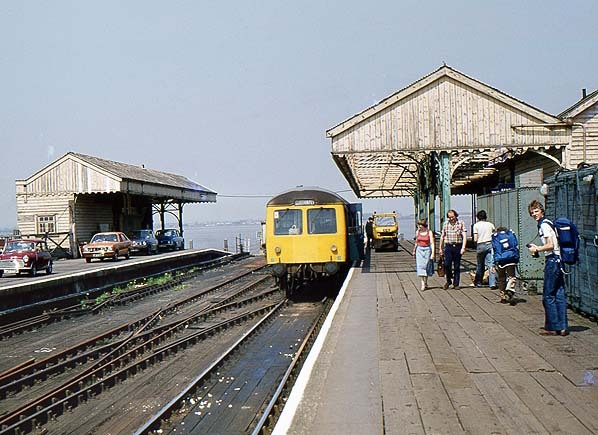 New Holland Pier and station in April 1982, 10 months after closure. New Holland Pier station in May 1988. The conveyor sits on the track bed. New Holland Pier seen from the south bank of the Humber in July 2008. The station buildings appear to be unchanged. Aerial view showing the current grain and animal food terminal at the pier head and the refurbished station buildings.